The very roots of religious tolerance can be traced to Maryland, which has led Frederick County to become the home to a variety of religions and historic houses of worship. Frederick's earliest settlers soon established Catholic churches in their communities, with one of the first churches, St. John the Evangelist Roman Catholic Church, consecrated in 1837. Tour the home of the first American born Saint, Elizabeth Ann Seton. Self-guided and docent lead tours of the grounds include a video presentation depicting Elizabeth Seton&apos;s life and accomplishments, the original 1770&apos;s farmhouse and the colonial style and the beautiful basilica dedicated to her memory. The National Shrine Grotto of Lourdes is the oldest replica of The Grotto of Lourdes in the Western Hemisphere. Nestled in the glorious foothills of the Catoctin Mountains, the grotto is a peaceful place to relax. Listed on the National Register of Historic Places, the Carriage House Restaurant in Emmitsburg was built circa 1857, and the building became the Zimmerman and Maxwell Feed and Grain Warehouse in 1877. After the turn of the century, it served as a broom factory and later a bus depot. The restaurant offers quality and gracious service in an elegant country atmosphere. 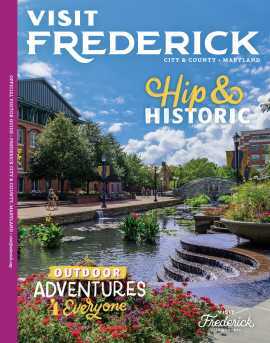 More than 200 specialty shops, art galleries and restaurants can be found in bustling Downtown Frederick. The cemetery is the final resting place for many notable figures, such as Chief Justice Roger Brooke Taney and Father John McElroy, S.J., who founded St. John’s Literary Institute. Also of interest are a number of French settlers and two of Napoleon’s soldiers who survived Waterloo. Tour the National Museum of Civil War Medicine to hear about the story of care and treatment of the wounded during the Civil War. 7,000 square feet of life-like exhibits tell the story of courage and devotion amidst the death and destruction of war. The Museum of Frederick County History is located in an 1820&apos;s Federal-style mansion that maintains a unique collection of furnishings, art and memorabilia from Frederick&apos;s past. Schifferstadt is one of America&apos;s finest examples of German colonial architecture. The 1758 stone house is one of the earliest known homes in Frederick and has several unique architectural features such as the five-plate stove, which is the only example its original position.